Can such an uplifting, timeless experience as listening to a bird trill fall outside our immediate desire to understand and quantify it? When is a bird trill just a bird trill? Never! Unless our existence is taken by surprise and it is being held under a temporary abeyance. Apart from that, the colours of our dreams are mere instances of the social forces which commingle in ways meant to haunt us forever. Ziad Antar has developed his practice out of working from a given situation that he might find himself in, revealing, say, the materiality of that experience. Time is used by Antar almost like in a folk tale, which is told and retold carrying and acquiring, through the passing of time, new shapes and meanings, always on the move, never fixed. A photographic residency in Saudi Arabia becomes years later a public sculpture park in London. The original issues having morphed into something else. Never frontal, Antar’s approach skews the difficult dichotomy between fiction and reality, driven by the desire not to simply mean. In taking further this problematic, Antar does not make recourse to conventional antagonisms, to merely anti-, but instead questions the basis of categorization itself. The current project titled Safe Sound II involves transferring into colour the trill of the bulbul a familiar, little bird found in the Middle East, known for its sharp and punctuating trill. To fulfil this project Antar worked with the scientist Yasmina Jraisati and by using a tuner, they translated the birdsong into colours. The result was always the same: black, white and a dark combination between primary colours. Our Western world is still very precious about colours and has even specific emotions attached to them, which inadvertently consolidates categories of positive and optimistic colours versus depressing ones like black, e.g. Is black the colour of death? Only if death is placed in opposition to life, or absence contrasting with presence is seen through the lens of negative and positive. One solution was found, a spanner in the wheel: let’s disorientate this translation of sounds into colours by applying a mathematical formula taken from the Romanian artist André Cadere, who became known in Paris in mid-1970s for his barres de bois rond. He would carry his barre de bois rond, (a colourful walking stick) with him while attending exhibition openings across the artistic capitals, west of the Iron Curtain. The barre de bois rond, which he was always eager to explain that a mathematical formula was required to generate the blocks of colours that composed it must include an error. The same formula including the inevitable mistake, has been appropriated by Antar for painting the 52 little sticks forming the birdcages for the bulbuls. By doing so it seems that he frees the colours from the burden of specific emotions and vice versa. The same question comes back again: when is colour just colour? Never. They say don’t buy a house plant as a gift to someone since it comes with a burden, as to say, you are imposing a responsibility on the receiver. 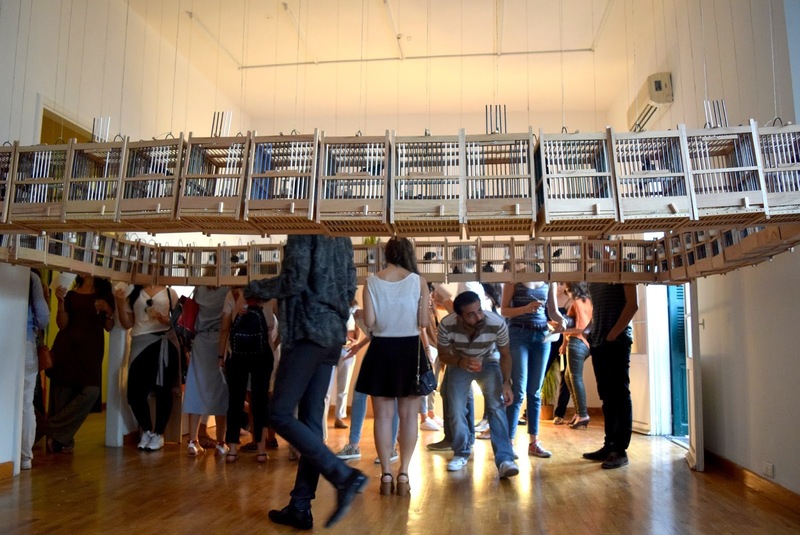 Antar’s project involves receiving such a gift as a visitor, namely a bird in a cage to take home, which can easily be domesticated in the back garden or a nearby tree. The bird will live there for as long it feels like it, in the moment that you thought you had tamed it, it might never come back. The bulbul comes with no insurance. It may play with your sense of possession and entice your expectations at regular hours of the day.